E.A. 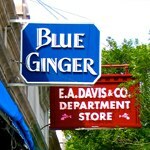 Davis offers the same things it did over 100 years ago when Emma A. Davis founded the store. At a time when few women worked outside the home, Davis, a woman of classic good taste and the entrepreneurial spirit, did more than just work – she began her own business. This business continues to thrive today. E.A.Davis is located in the historic Boston suburb of Wellesley, Massachusetts. It is still operated as a family business. Those that frequent the E.A. Davis Web site will receive the same quality customer service that everyone who has walked through the doors of the Wellesley store has received since 1904. If you would like further details or more information regarding any of the brands or products we mentioned, please contact us via email, telephone, fax or mail. We will do our best to track down a specific item or simply answer a question you may have. You can also complete this short form any time.